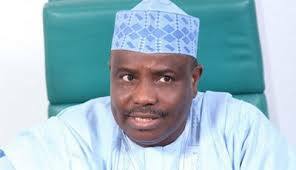 The Peoples Democratic Party (PDP) presidential aspirant and Governor of Sokoto State, Aminu Tambuwal, has berated the Federal Government under the All Progressives Congress (APC) over the high cost of food stuffs, hajj slots, petroleum and exchange rate of US dollar to Nigeria’s naira. The Sokoto State governor, who stated this during his visit to PDP Secretariat, Kebbi State chapter, on Tuesday, noted that insecurity in Nigeria might be worsened if the nation’s leadership were not replaced with PDP during 2019 general elections. Said he, “I came here to exchange pleasantries with you as brothers and sisters and also to present myself before you as Presidential Aspirant under PDP platform. Kebbi is our home and that is why we started our campaign here. “We left PDP then because of the situation the party found itself, not because of our selfish interest but because of our people. Today, every Nigerians know the level of inflation in the country. “We were told that if subsidy were removed our money will be channel to our States and it will benefits common man”. Asking rhetorical questions, Governor Tambuwal asked party members what the prices of bags of rice, petroleum products, hajj slots and exchange rate of the dollar to the naira. He said they were N7,500, N87per litre, N7500,000 for hajj slot and N160 for a US dollar. “Today, even in Kebbi State which they call home of rice, a bag of rice is N15,000, petroleum is now N147 ,hajj slot is now N1.5 million and many of our people cannot afford to go to hajj. “Again, when the PDP left US dollar to a naira was N160 but today it is N365 for a dollar. Nigerians can’t continue to bear this anymore. “The insecurity in Nigeria is worse. We have seen how Boko Haram wrecks havoc. Today, there is banditry in Zamfara, kidnapping in Kaduna and many other states. If we don’t change leadership of APC, the situation might worsen “, he said. The former Speaker of House of Representative, also condemned alleged selective prosecution by EFCC stressed “If any suspected corrupted public officers defected to APC, their cases closed”. He added that he would accept the outcome of the PDP presidential primary that will be hold in River state and ready to work with any aspirant that emerged as the party presidential candidate. The Director General of Tambuwal campaign team, Abubakar Chekary, informed PDP members that Governor Tambuwal was elected as the Speaker of the House of Representative during the immediate past President, Dr. Goodluck Jonathan because of love his colleagues have for him and if elected as the nation’s President, he will reduced poverty and united the country. Deputy Chairman of PDP in Kebbi State, Musa Argungun, earlier assured Governor Tambuwal and his team that the party’s members would support his aspiration and mobilise for him ahead of PDP presidential primary.